Which of Disney's iconic princesses does America adore most? 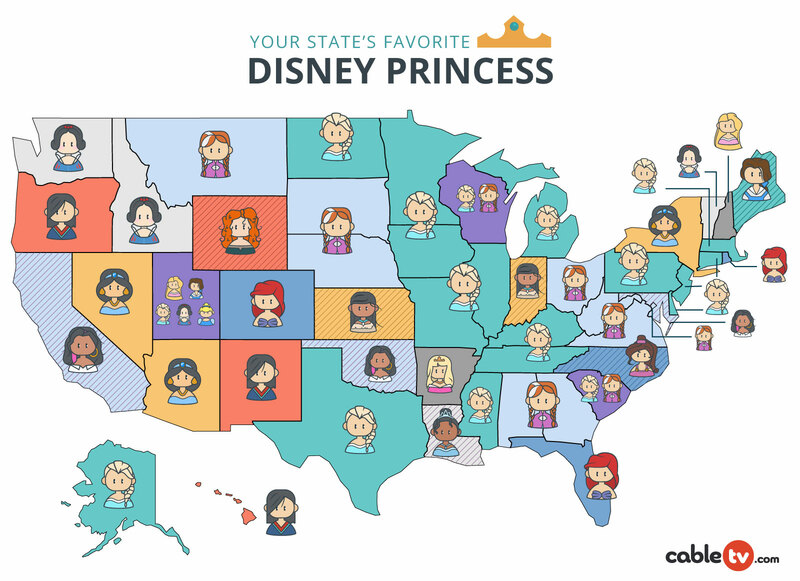 To celebrate the anticipated release of Disney's "Ralph Breaks the Internet," the analysts at CableTV.com created a national report revealing each state's favorite Disney princess. Ariel from "The Little Mermaid" was popular in Florida, which seems on brand for a state with 663 miles of beach. Wyoming is a big part of America’s bear country, which probably contributed a lot to Wyomingites’ love for the bear-wrangling Merida from "Brave." Esmeralda, the kind-hearted Romani woman from The Hunchback of Notre Dame, took first in California, which has a dense Romani American population. To determine each state's favorite Disney princess, the analyst team made a list of the sixteen most popular Disney princesses and heroines, and ran them through Google Trends to find out which characters got the most traction over the past twelve months.